Most people focus on their dog and don’t think about the person that goes into the field with them. SAR dogs live with and are owned by their handler. If you have a medical condition that prevents you from walking and carrying a 40 pound pack for hours at a time, then look into a sport that meets your physical needs. The handler will have to get first aid and orienteering training and earn a ham radio license. Could you camp out overnight with an injured person and keep them and you and your dog alive? Could you set up a an evacuation site? Could you help carry a full grown man for miles? These are the demands SAR makes on the human side of the equation. I can’t count the number of times someone has wanted to join the team because of how their dog follows scents in the backyard. Being willing to follow a scent is good but a SAR dog is more than its nose. 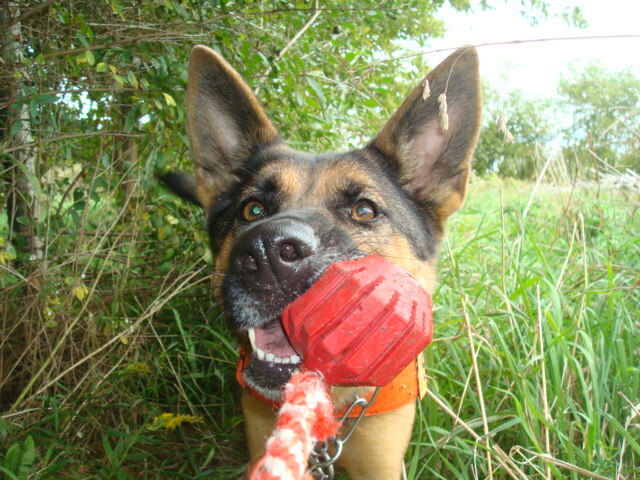 We are looking for a high drive dog that will work for hours and hours for the opportunity to play. That’s right, play. SAR dogs are not altruistic, they are working for a reason not because they want to help a human. German Shepherds are one of the breeds with the strongest pack drive, this means they care for the welfare of their pack (family) but that is not why they search. They have been taught, that if they find a person they will get their reward, usually playtime. On television they always show the SAR dogs on-lead sniffing the ground. Unfortunately SAR dogs are a tertiary response level. That means the dogs are usually called after the police, fire department, Boy Scout troops and groups of well meaning citizen. The track left by the subject has been trampled and scuffed into oblivion. Frequently dogs are called in when they want to make sure they have expended every effort to clear an area not because they expect them to find anything. 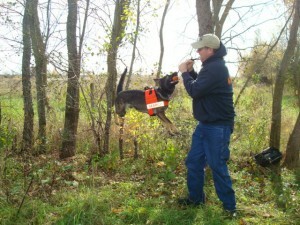 The most effective training for a SAR dog is as air scent. Instead for trying to follow a scent on the ground, the dog is left off-lead and allowed to roam free. If they find anything with human scent they indicate to the handler. In seventeen years of K9 SAR work I have had only one tracking assignment. How much time and money do you have? Keeping you and your dog is search ready form is almost a second full-time job. I was working 70 hour weeks when I got hooked on K9 SAR, I changed jobs and ultimately took a cut in pay to be on a SAR team. As for pay, you aren’t. You will pay for your dog, its training and all of your equipment. Depending on the search, you may take money out of your pocket to mobilize and get to a search. Depending on how long the search goes, you may be paying for hotels and food, too. This is a situation you have to look at before getting involved. If you are volunteering it can’t negatively impact your family or you won’t be able to stay for the long-term. German Shepherd Search and Rescue Dog Association collects donations so we can pay our handlers gas, hotel and meals while on searches. No one draws a salary. 100% of all donations go into training costs and search costs not into anyone’s pocket.